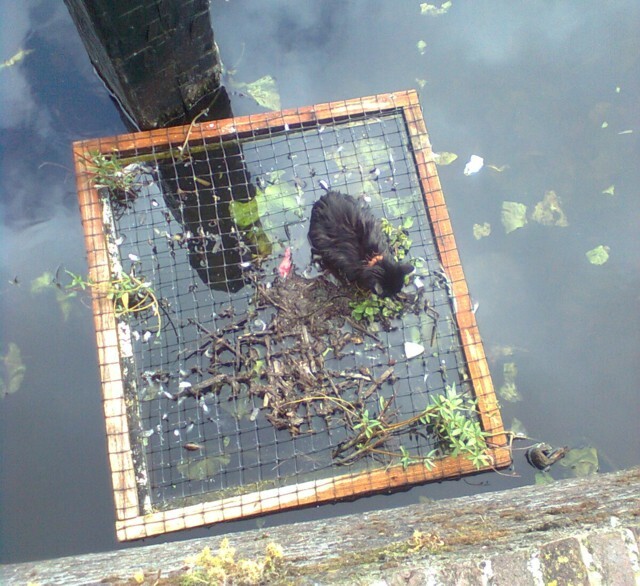 Because lots of cats died from drowning in our neighbourhood, Havenwijk-Zuid in Leiden, the Netherlands, we devised a simple but effective plan: Feline Lifelines ('Kat uit de Gracht'). providing lifelines or other items onto which a swimming cat can climb, like floatlands. We have received hundreds of metres of sturdy boating rope from donors (i.e. Touwhuis van Adrichem , DFDS Seaways, Connexxion Water and Fugro) and we've started to hang those ropes along the docks and canals in our community. If feline lifelines are not an option, we have now devised small floating islands, on which cats can climb to save themselves. We also use (social) media to promote awareness with cat-owners: keeping your cat high and dry is quite easy, if you know how! We made an instruction leaflet, see our downloads-section. Inspired by Leiden, Feline Lifelines has now been set up in lots of other cities, including: Amersfoort, Hoorn, Almere, Utrecht, Vinkeveen and Groningen. 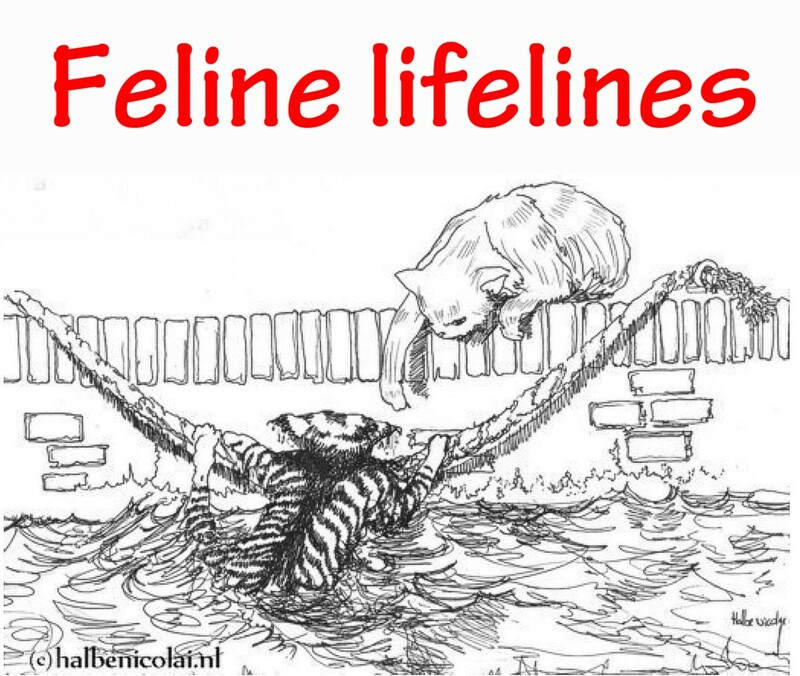 This is how a Feline lifeline works!! Since the start in May 2009 at least 75 cats in the Leiden region have succesfully been saved by the various methods devised by Feline Lifelines. At least 17 animals used a feline lifeline. More than half of all the swimming cats were saved by passers-by (see picture). Another dozen of cats saved themselves, being watched over by bystanders who could help if necessary. But...around fourty cats have also been found drowned in the same period. We are disappointed but have all the more reason to continue with this project; not only in our hometown Leiden, but everywhere else in our country, since most cities have canals. We are sponsored and supported by the Animal Welfare (Dierenbescherming, region Rijnland), and backed up by various Councils, the Watermanagement departments (Hoogheemraadschappen), two Federations of Animal Ambulances and various other institutions and groups. The page 'reddingsmiddelen' (ways to offer cats a 'lifelline') describes the three options including contactdetails and prices. Through research we have now come up with more than 15 different reasons why cats fall into canals and drown. Of course, we provide visitors to our site with just as many solutions, to keep their cats 'high and dry'! We have a new page called: 'Help! A swimming cat! ', with tips how to save the animals' life (because the animal ambulance or fire department will in most cases be too late). KUG has now so many independent communities all over the Netherlands, it's hard to keep track of their good actions! Please see the Dutch pages on the left of this site for their endeavours. KUG Vinkeveen has fixed 300 metres of lifelines to slippery canal walls! Fortunately, KUG-Delft had some rope in stock for them. KUG Hoorn still needs more Lifelines! DFDS Seaways is their personal sponsor, with large pallets full of wonderful yellow, sturdy mooringropes of 110 metres long and sometimes twice that, if we're lucky! KUG aka Feline Lifelines introduced itself nationwide on 27th November 2010, during the annual congress of the Federation of Animal-Ambulances. This was a great opportunity to exchange information and knowledge of a problem we both encounter just too often (drowned cats). 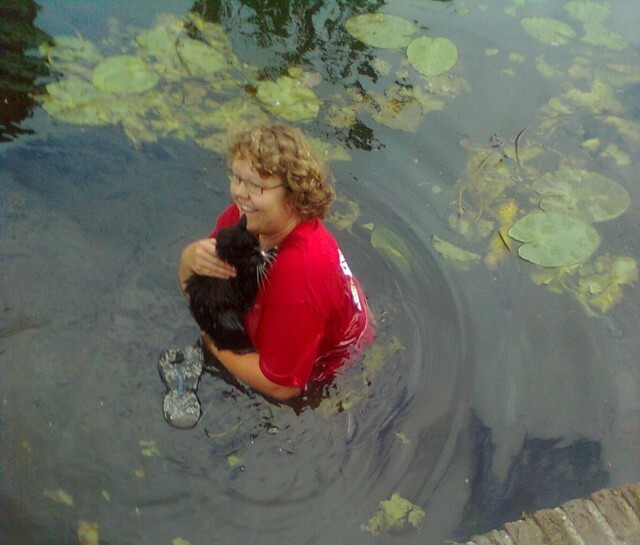 a new city has started its own Feline Lifeline group, Hoorn, after more than twelve cats drowned in over just a month time, starting October 2010. They have started to fix the lifelines onto their canalwalls in January 2011.
there are various informationleaflets available online, for locals who (might) want to start their own Kat uit de Gracht, and for councils and other officials, who have to approve of the feline lifelines. as a result of the article in Majesteit two volunteers in the city of Delft started following our guidelines and began their own feline lifeline-group! from March onwards we received a couple of more requests from other cities for help: they would like to start their own 'feline lifeline' activies there as well: Delft, Edam, Amersfoort and Groningen. in March 2010 we went to meet our new rope-distributor, Touwhuis.com in Alblasserdam. He gave us 100 metres of very nice feline lifelines! 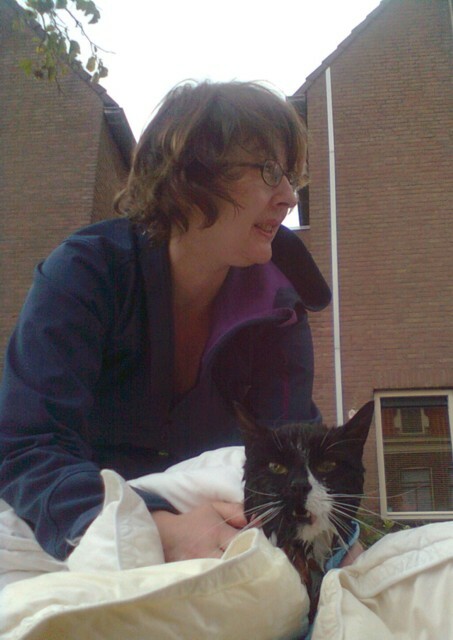 in November 2009 we were contacted by another group of cat-lovers from Edam, and their spokesperson from the Partij voor de Dieren from Noord-Holland. Since they have the same high canal-walls as we do, they thought it wise to ask us how we started our campaign. And how we got the council to agree with the plan, because that's a big issue in Edam!